This Projector Cart Is Durable and Built to Last. The Steel Construction has a Black Finish. This Projector Cart is Sleek and Suits Many Environments. 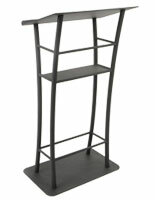 Black powder coated steel for a durable stand meant for years of use. Equipped with (4) 4" swivel casters (two locking) to easily move around a space. Includes a security drawer to store valuable items and equipment when not in use. Includes a neoprene mat for keeping equipment in place on top shelf of cart. 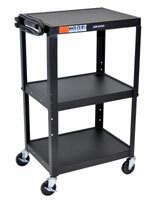 This projector cart that has caster wheels can be rolled around a room or even to different classrooms in a school setting. 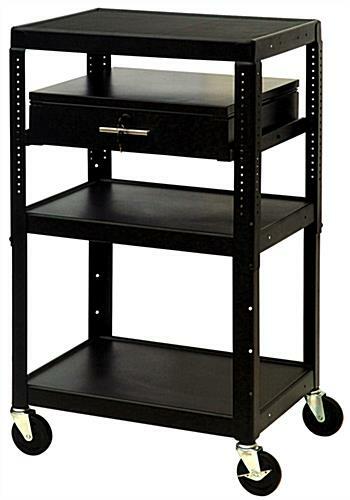 These storage trolleys can be used to hold a laptop computer, projectors, dvd players, and more! 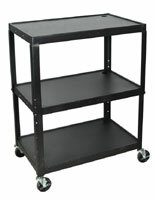 This 3 shelf projector cart, also known as an AV equipment holder, includes 24"w x 18"d shelves. 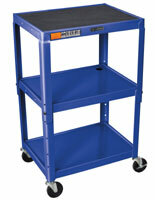 This AV equipment storage trolley is constructed with steel for a lasting fixture in classrooms. This projector cart that has a shelf mat to keep a laptop computer or other equipment in place is ideal for educational classrooms. This multimedia equipment storage trolley has a security drawer that is 19-1/2"w x 18"d x 5"h. This projector cart ships ready to assemble to save on shipping costs! This storage for AV equipment is an ideal presentation platform in the classroom. 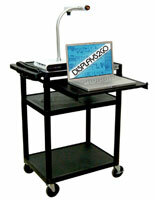 This projector cart is durable and versatile! This display is meant to last. This projector cart includes a UL listed power cord as an added bonus! Purchasers just need to supply the equipment. This laptop computer trolley, projector cart that includes a security drawer provides a place accessible only to the key holder to store items. This classroom AV display includes a mat on the shelf to keep equipment in place. This black finish projector cart with the security drawer has the option of pulling the shelf out from the front or back depending on presentational needs. The locking drawer is very useful in keeping equipment and other items secure. This rolling cart made of durable steel is sleek and will suit nearly any environment. Manufacturer model# MDC4226E. 19.5" x 5.0" x 18.0"